Much has happened in the last six weeks, so let’s hit the ground running. The launch of the new website has been excellent bar a few teething problems, The Instructor and FIT2FITER portals are gradually being populated with “good stuff” and access has now been granted to all those eligible. Apologies about the lack of access to the SHOP. We are commissioning another photoshoot and expect to get the merchandise on-line in the near future. In April FIT2FITE welcomed seven new Instructors to the F2F Family. They are the first to qualify under the new revamp and we wish them all the success with there new F2F classes. The Membership (FIT2FITER’S) is being trialled at the Barking Abbey School Fit2fite class with tremendous take up and interest in the revolutionary F2F Grading. The Pilot FIT2FITE Grading is tentatively scheduled for mid July with roll-out to all classes soon after. FIT2FITE engages Tension, Timing, Technique, Tension with the funkiest Grooves on the planet to develop and enhance Strength, Stamina, Suppleness and Speed. FiT2FITE founder Greg Francis has just returned from Fuertueventura under the FITFEVER banner delivering F2F classes to nearly 300 people at the world famous, Playitas Sports Resort. Great feedback for F2F classes, Super 7 Circuit and F2F Flexibility. Big shout out to one of our primary sponsors 3NESS and their Director Paul Francis for another excellently organised event. 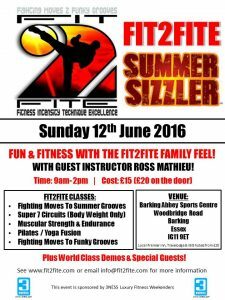 Finally, the Summer Sizzler is back on Sunday 12th JUNE. Five hours of Fitness, Fun and Funky Grooves with guest Instructors, World Class demo’s and the return of our Percussionist, “Fast hands” Don. Please book early to secure your place. Click here for a PDF of more details.